From March 16-20 CODOS team members circled Colorado collecting snowpack and dust-in-snow observations. Fortunately we were able to take advantage of a ~7 day window of beautiful weather to do this trip. General observations is that there is a lot of snow in the high country. A lot of snow not just where you would expect it, but also areas like mountain valleys, southerly aspects, and typically wind-swept high elevations. Following the last storm 9 days ago the snowscape took on a Dr. Seuss quality with large billowing snow and completely covered and sculpted trees and mountains. To help maintain this quality another storm rolled into Southern Colorado on Thursday mostly benefiting Southern Mountains (storm report to be published soon). Another system will travel through the Northern Rockies Saturday and Sunday, then a significant warming trend will take hold for a few days before the next trough arrives later in the week. With rain and wet melting snow at lower elevations we can expect to see a bump in streamflows. Overall dust conditions are mostly minimal throughout the state. A moderate dust event occurring March 6 is very visible near Rico, Silverton, and at Wolf Creek Pass. At Wolf Creek it is located 0.5 m (2’) below the surface. At SASP we will note the presence/location of the dust once Highway 550 reopens and access is possible. Going towards the Central Mountains (Park Cone, McClure, Grand Mesa) dust presence is less obvious. At these sites we noted a layer that could be a dust layer but it is so light and diffuse it is difficult to definitively ascertain its presence. Judging by observations in the San Juans, dust likely does exist in these regions within the snowpack but the good news it is very light indeed. In addition to direct observations the inspection of photographs from CAIC field reports often help fill the spatial gaps and offer additional information. A couple of field reports indicate a good amount of dust from the March 6 event near Lake City (no surprise there), Aspen Highlands and near Highlands Ridge. In addition, very experienced snow science colleagues have also been making observations around Colorado. Both of these colleagues collected observations near Crested Butte. One observed a light dust layer, the other did not, this is a good example that when/if dust is present it is of a very light nature. Moving more towards Northern Colorado (Hoosier Pass, Loveland Pass, Berthoud Pass, Willow Creek, and Rabbit Ears) dust was not observed. In summary, a light dust event was observed from a February 3 storm near Lizard Head Pass but not SASP to date, indicating it likely did not exceed far past the western San Juans Mountains. A notable dust event occurred on March 6 that is easily distinguishable in the San Juan snowpack, more spotty in distribution and much less severe towards the Central Mountains near Aspen and Crested Butte. To put it all in perspective so far this season we are doing quite well compared to other years in our record. The wet southwest desert so far this season has translated to very little dust – both in number and severity - in the Colorado Mountains. Hopefully the trend will continue as we move into spring. With such a huge snowpack we want the snow to melt out slow over a long duration. Just one nasty dust event this time of year could drastically alter snowmelt and runoff scenarios. Good news! Just received word that Red Mountain Pass has reopened. In the near future expect to see an Update that includes data from SASP. Swamp Angel: We have not been able to access SASP since Highway 550 was closed due to massive avalanches covering the road. Fortunately automated data collection has not faltered, but we are unable to visit the site to collect SWE and dust observations, sweep snow off the uplooking radiation sensors, and install the stream gauge sensors to begin measuring discharge. Senator Beck: Both avalanche danger and a closed highway 550 have kept us out of Senator Beck Study Plot to date. We are optimistic that we’ll get up there soon. Wolf Creek Pass (March 16): Dust observed at snowpack heights 7.9’ (2.4 m), 6.9’ (2.1 m), 3.3’ (1.0 m), and 2.6’ (0.80 m). We will confirm when we visit SASP, but it appears the bottom two dust layers are unique to Wolf Creek, these two layers are from early in the season when we had yet to observe dust at SASP. These two layers are moderate in severity. The top two layers are light. SWE = 33.7” (857 mm). 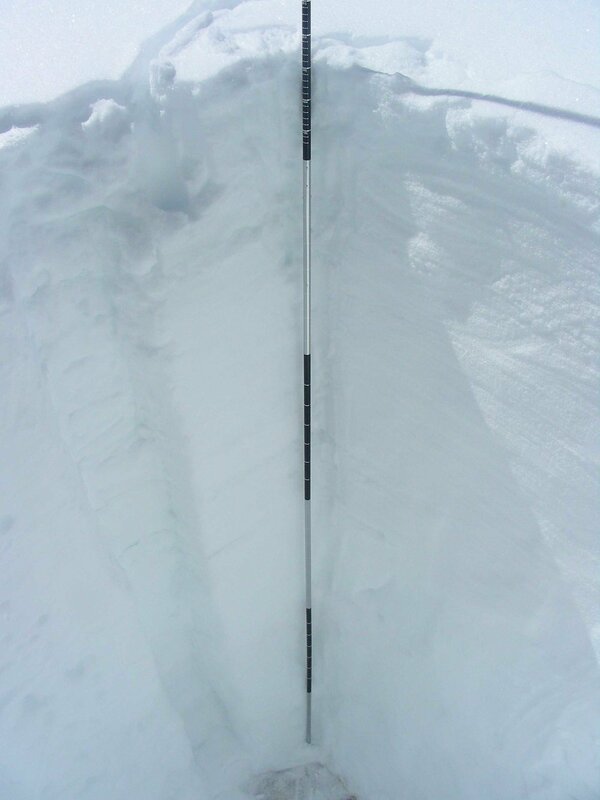 Snowdepth = 9.8’ (3.0 m). Spring Creek Pass (March 16): No dust observed. Snowcover is complete across the landscape including Rio Grande Valley. SWE = 16.0” (407 mm). 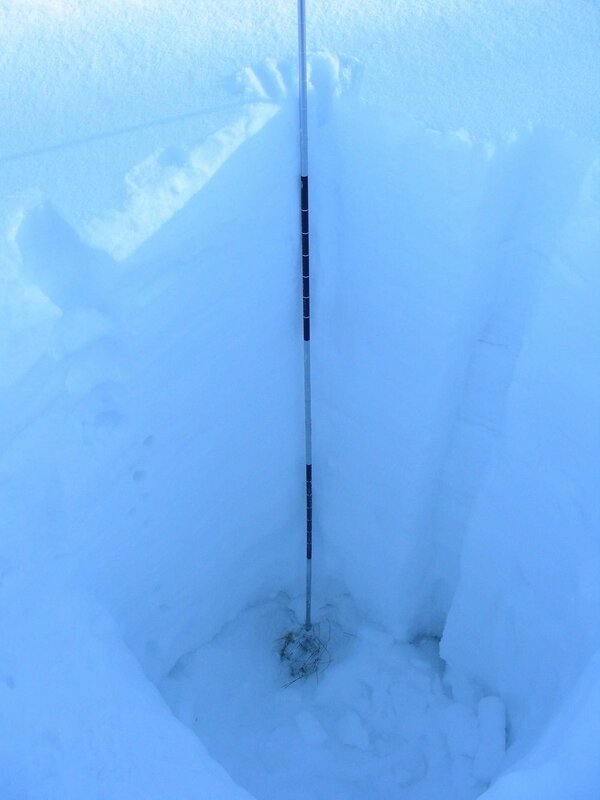 Snowdepth = 5.5’ (1.69 m). Park Cone (March 17): Possible light/diffuse dust at 1.00 m (3.3’). Complete snowcover including Gunnison Valley. SWE = 12.8” (326 mm). Snowdepth = 4.8’ (1.47 m). McClure Pass (March 17): No dust observed. Snow depth = 4.9’ (1.5 m). Deep snow and difficult access made for a slower than normal tour. We arrived on-site at sunset and did not have time to collect SWE and temperature information. Grande Mesa (March 17): Possible light/diffuse dust at 5.4’ (1.65 m). A lot of snow on Mesa and intermittent lower down in elevation. SWE = 26.7” (678 mm). Snowdepth = 7.4’ (2.25 m). In our March 1st SWE Update we used the DERC model for WY2019 to classify watersheds by either “Low”, “Avg”, or “High” March 1 SWE domains. All major basins fell under the “High” category except South Platte and North Platte which were on the high end of average. With one light event and one moderate dust-on-snow event so far this season, anything can play out from this point in terms of dust, it is still too soon to firmly classify dust events as either “Min”, “Avg”, or “Max” Dust. CODOS will identify prior season hydrographs that best compare to current conditions as dust and spring precipitation conditions unfold. Above: Since January 1 we have crawled out of severe to exceptional drought and are now considered abnormally dry in some areas and with a small sliver of moderate drought in Southern Colorado.